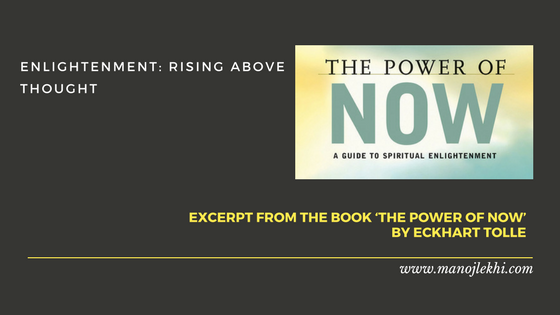 Excerpt from the book ‘The Power of Now’ by Eckhart Tolle (chapter 1). Ego a false self, created by unconscious identification with the mind. To the ego, the present movement hardly exists. Only past and future are considered important. It is always concerned with keeping the past alive, because without it- who are you? It constantly projects itself into the future to ensure its continued survival and to seek some kind release or fulfillment there. It says: “One day ,when this, that or the other happens, I am going to be okay, happy , at place Even when the ego seems to be concerned with present, it is not the present, that it sees: It misperceives it completely because it looks at it through the eyes of the past. Or it reduces the present to a means to an end, an end that always lies in the mind projected future. Observe your mind and you’ll see that this is how it works. But you cannot find the present moment as long as you are your mind. The mind is minds gathering, storing and analyzing information good at but it is not at all creative. All true artists, whether they know it or not create from a place of no- mind, from inner stillness. So I would say that the simple reason why the majority of scientists are not creative is not because they didn’t know how to think but because they didn’t know how to stop thinking! There is clearly intelligence at work that is far greater than the mind. Directing your thoughts towards what you want is our goal. For more information about the course kindly click the Link – The Success Cue.